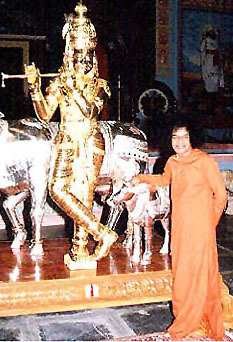 Sathya Sai Baba's alleged 'materialised diamonds' have been proven in some cases to be nothing but cheap synthetic stones, while none have ever been assayed by any independent expert and found to be genuine. Somewhat strange, considering that virtually all devotees believe fully that they are genuine stone of immense value! Would a real Krishna have needed to fake it like that? 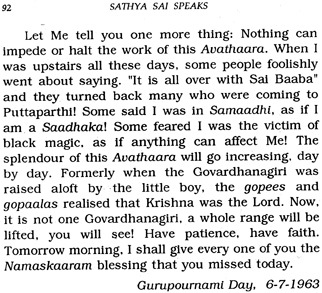 Sathya Sai Baba continually repeated the fantastical legendary events from Indian scripture as being historical fact, including Krishna's famous lifting of the entire Govardhana mountain to protect his devotees from a flood of rain! Not only that, but he proclaimed on at least two occasions that the time would come when he - Krishna reborn - would have to raise an entire range of mountains, presumably to protect his devotees. It is relevant that no 'flash of brilliant light' has ever been caught on the many films and videos of Sai Baba, not in any connection, though lots of brilliant lights have been used in images constructed to make Sai Baba seem other than he really was. Further, that Sai Baba 'materialised' genuine diamonds has never been proven, while numerous of his alleged diamonds have been assayed by independent professionals and found to be cheap paiste gemstones (such as synthetic sapphires with tinfoil behind them to enhance their brilliance though they cost very little). Would a real Krishna figure need to use fakes`? THE PREPOSTEROUS CASE OF THE "WEEPING SARIS"
"Swami, something has happened here. Water is around this box. These saris will get wet. (Swami removed the cover of the box and those of us who were standing there could see that the edges of the saris were wet. The cardboard box with four saris in it was lying on a table at the Dharmakshetra in Bombay. Swami had selected 96 saris for distribution to some lady volunteers, and of the 100 brought for His insepction, four were replaced in the box to be returned later to the merchant. The table was not close to any source of water, and Hislop, several other men, and Swami had been standing there from the time the saris were examined one by one, by Swami." Sai: "The saris are weeping because Swami has rejected them. Now, I will take them." Hislop: Swami! "How could that be? Does Swami say that inanimate objects have injured feelings and can weep?" Sai: "Inanimate objects are also capable of feeling joy and grief. When the bridge towards Lanka was built by the monkeys so that Rama could march to Ravana's kingdom where Sita was held captive, one last mountain peak was carried to the bridge site. But it was too late. There was no need for it. At this circumstance the mountain shed tears of anguish, and news of this was quickly taken to Rama. His compassion was great, and he sent word that the mountain should no longer sorrow, that he would surely use it on a future occasion. In the Avathara of Krishna, it was this very mountain peak, the Govadhana Peak, which the youth, Krishna, lifted on his finger to shelter the cowherds of Gokul from Indra's deluge of rain." Sai: "Yes. And it is also the self-same Rama and the self-same Krishna who is here this day." Do these 'animated saris' tale need any comment? It certainly seems it does, if only because many devotees believe it, especially those misguided Hindu Sai-devotees! Not only does this conflict with other 'teachings' of SSB about the differences between the various realms of beings, but it makes one think that SSB is seeing just how far he can push the credulity of a man who held a Western Ph.D, as did Dr. Hislop. Hislop retold the story with relish and naive faith! One would think that such a person must at least have passed the test of 'blind belief' that SSB has set up for a true devotee etc. and qualified for 'liberation'? But no, we are told by Hislop in his last book that Sathya Sai Baba told him he must be reborn again, even though he had seen the so-called 'lingodbhava' many times and had worked ceaseless for SSB for decades! A dis-grace!